It’s important not to be too busy to think about innovation… Because your competition isn’t going to stand still. When you are ready for innovation, you have to think out of the box — which can be hard! At the end of the day, innovation is hard work — but it’s worth it! Alexa, what’s the next big breakthrough in computer interfaces?! How about — bear with me here — we actually try to change something?! Do you have problems thinking outside the box? Unauthorized drone usage? You’re suspended! Fed up with talk about digital disruption? You’re not the only one! Top executive tip — promise what you can’t deliver! Beware of executives reading airline magazines! You have to “skate to where the puck will be” — or do you?! Why is so much “innovation” just so… small-minded? 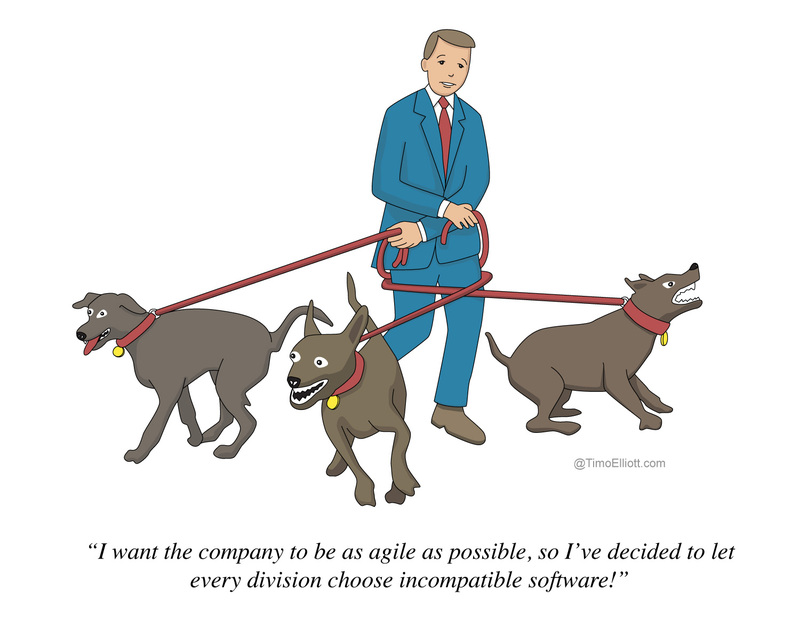 These cartoons are a great and I would like to use some on our internal company website. The use is non-commercial and meant to inspire more innovation in our company. I will of course give credit to you. May I have your permission? may I use some of these cartoons for an internal team meeting ? This is not commercial. Would it be possible to use these cartoons internally? These cartoons are great! May I use some of them (by giving reference to your website) for an internal team meeting ? This is not commercial. As others have expressed, these are brilliant cartoons that we would like to use for presentation purposes within our organization, to illustrate the common pitfalls and help promote a more innovative culture. What is the process for requesting permission for such use? If you have the time and the will, I wold be happy to try and inspire you for cartoons about machine learning and AI. I’d much like to use one of your images in a personal LinkedIn post about innovation and change. I will give full credit, tag back etc. I’m honored — please go ahead! We have an internal workshop working on an innovative ship with clean energy. I would like to use one of your innovation cartoons. Christine, please go ahead. Good luck with the ship!